This cross was probably set in the atrio, the large patio in front of the church dedicated to the Virgin of Guadalupe in Tepeyac. Like other atrio crosses, it is carved with pictures and symbols relating to Jesus’ Passion—the trials he endured after being captured by the Romans and sent to be crucified. 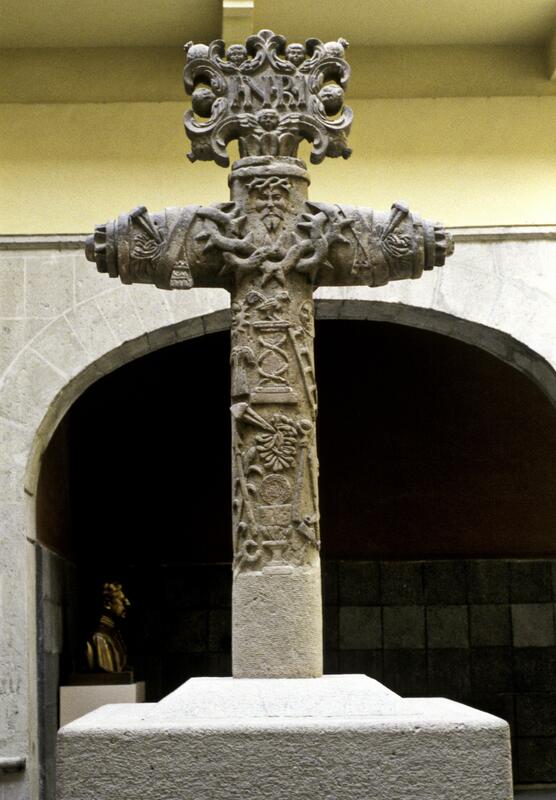 The 16th century friars at Tepeyac may have used the cross as an aid to teach their indigenous converts. While the shape and symbolism of this cross is similar to others made in New Spain in the mid-16th century, it is carved in much deeper relief. The initials INRI in the square cartouche at the top of the cross stand for “Jesus of Nazareth, King of the Jews.” These are the words, mocking and prophetic, that Pilate called to be posted at the top of Jesus’s crucifix. A halo of plumes surrounds the initials, like the feathered headdresses that Aztec warriors and rulers once wore. Symbols of the Passion decorate the cross, including the nails that Jesus’ captors used to affix his hands and feet to the cross. The image of Jesus’s face at the center of the cross recalls the image imprinted on the cloth of St. Veronica, who wiped Jesus’s brow during the Passion. 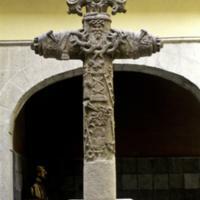 Elena Estrada de Gerlero speculates that the cross was made by a highly trained indigenous sculptor around the time that the archbishop Montúfar founded a hermitage at Tepeyac. The carver probably worked from models provided and discussed by the Franciscans, as well as his own knowledge of stone carving. The cross is made of hard volcanic stone, a widely available material in the Valley of Mexico. Many indigenous churches in central Mexico have similar atrio crosses, for example the church of Acolman. This cross was once set in the atrio of the church at Tepeyac dedicated to the Virgin of Guadalupe. Catholics linked atrios to the Garden of Paradise. Atrio crosses like this one were thereby parallel to the Tree of Life that grew at Paradise’s center, making visible the link between the Fall of Mankind, as Adam ate the forbidden fruit, and its Redemption, which Christians believe happened through Jesus’ resurrection after crucifixion. Imagery on atrio crosses may have had special appeal to indigenous viewers who remembered the pre-Hispanic period: the halo of plumes is like the feathered headdresses. The blood-drawing nails are close kin to the bone awls used for ritual bloodletting. And trees, symbolizing the World Tree, an axis mundi, were often erected in the center of plazas. This crossing of ideas may well have existed with full knowledge of the Catholic friars in charge of evangelization. Many mendicant churches—including this one—were built upon the site of pre-Hispanic shrines, and sermons written in native languages reveal that friars consciously harnessed native beliefs and religious vocabulary to reorient it towards Christianity. Estrada de Gerlero, Elena Isabel. 1990. "Atrial Cross." In Mexico: Splendors of Thirty Centuries. Pp. 250-251. New York: Metropolitan Museum of Art. Lara, Jaime. 1996. “El espejo en la cruz: una reflexión medieval sobre las cruces atriales méxicanas.” Anales del Instituto de Investigaciones Estéticas 18 (69): 5-40.